“The man in black fled across the desert, and the gunslinger followed.” With these iconic words a sweeping, epic series of novels by Stephen King redefined genres. The plan to adapt The Dark Tower series into live-action was an elaborate and eventually unsustainable project spearheaded by Ron Howard that was to span multiple media platforms, including several films and a TV series. Audiences instead wind up with an extremely condensed version of the entire book series overstuffed into a surprisingly short film that will most likely disappoint longtime fans. Idris Elba stars as Roland the last gunslinger – a man seeking revenge and the last in a legendary line of Samurai-like warriors that employ revolvers instead of swords. Elba is a talented actor and brings his stoic haunted hero specialty to the role, but it isn’t quite enough to live up to the character from King’s novels. Elba is more of a handsome, muscular badass in Matrix-like coat and armor than the weathered, grisly old man staring down death in his final days. While Elba’s Roland only slightly misses the bullseye, the inspired casting of Matthew McConaughey suffers greatly from the smashing together of eight books worth of story into one ninety minute film. The man in black is intended to a be a powerful, enigmatic force of evil, but The Dark Tower film extinguishes any of the character’s mystery and speeds through his plot of destroying The Dark Tower to bring destruction into our universe with ridiculous sci-fi villain tropes – he has goofy incompetent henchmen, he hurts/kills them when they mess up, and has a sci-fi lab base with a giant laser in the sky. Thankfully one of the harder elements to adapt goes pretty well in the film, with Tom Taylor’s performance as the pivotal character of Jake Chambers. The film doesn’t hit some of Jake’s more iconic and dramatic beats from the series, but Elba and Taylor have solid chemistry in their mentor/mentee relationship. Smaller moments that were adapted for the characters like Roland trying Coca-Cola for the first time provide some nice levity and character growth and Taylor is note-perfect as the gifted youngster. 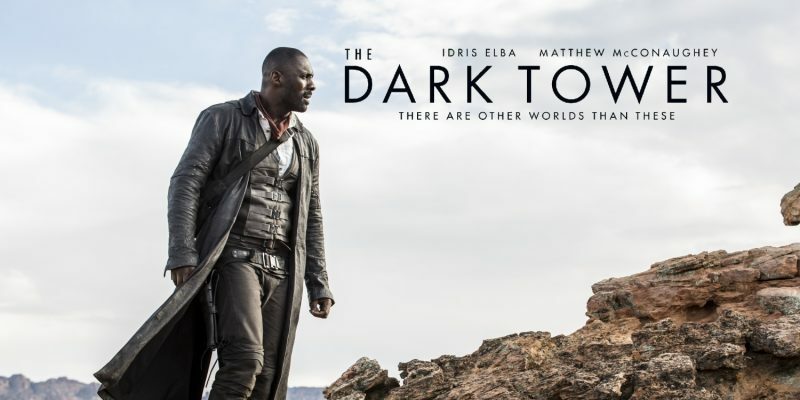 While I will admit to having preconceived notions about what this film should have been due to my affection for King’s novels, I won’t say that The Dark Tower is the disaster many expected – in fact I believe it might actually be a very entertaining and original sci-fi fantasy film for audience members who haven’t cracked the books. The film’s cinematography is beautiful and the retro/futuristic hybrid of the other world’s is fun to discover – although they went more high-tech with the door portals than I would’ve liked. My personal preference was always to see The Dark Tower adapted as a limited series by one of the higher tier networks like HBO or Showtime. I don’t think this film is the way most wanted to see Roland and his quest brought to life, but it’s tough to argue that King’s novels don’t have a ton of fat to cut. The film gets an extra pat on the back for some excellent action scenes that really bring the gunslinger’s abilities to vivid life. Perhaps fans are better off with this ninety minute band-aid pull than a prolonged slog through a more ambitious adaptation? We’ll probably never know… but there are other worlds than these.